I made a New Year’s resolution, and I’m sort of on my way to keep it (them). I wanted to do something similar to The Happiness Project with some flexibility. A lot more flexibility. I’m not necessarily focusing on one aspect of my life or something I want to improve upon each month, but rather focusing on a topic and then moving on to something else once I feel I’ve adequately achieved it. To start off 2013, my goal was to to eat out no more than 1-2 times a week. It’s been two months. And I’ve nailed it. I’m happy, and so’s my bank account. Will I be able to continue with this for the rest of the year? I’m using the 1-2 times as a benchmark but there may come a time when I break it. For example: My two trips to Chicago next month. My next goal is also food related, and it’s to limit meat consumption to 1-2 times a week. This is easier typed than done. I’m in the middle of a Coursera class about the U.S. food system, and it’s really opening my eyes. Things I’ve known on the surface but now delving deeper. Issues I pushed aside for fear of the truth and the impact not only on the rest of the world but my own long-term health. It’s an ambitious goal, and one I’m not going to beat myself over if I’m not successful. That’s how I’m approaching this year with my resolution. If I have the strict barrier, I feel like I’m not going to enjoy it as much. Is that weakness? I like having the goal but also the flexibility to break it — and not feeling guilty about it. Of course, I’m not going to break it every week, but I’m not going to be overly stringent on it either. Well, that’s my thinking at least. Let’s see how it actually turns out. One of my favorite copy editing gigs is for Open Air Publishing, which produces how-to books for touchscreen devices. I get to play around on the iPad and learn about topics like Blackjack and knife skills in the kitchen. What makes these interactive books stand out from the competition is that because they’re specifically designed for the iPad, meaning learning involves swiping, playing and listening. Novels and such are just thrown onto your reading device with no thought for the different ways we absorb information. Can you imagine textbooks being created like this? How much fun would learning be then? One of the titles I helped edit, Wine Simplified, this week was named best nonfiction app! Check it out. Seriously. You won’t be disappointed. I swore off hockey when the season didn’t start on time because of the lockout. I really did! I went on a massive unfollow spree on Twitter, and I didn’t allow myself to get ever so optimistic when one tiny bit of news about meetings or proposals came about. And you know what? My life felt a bit more peaceful. I barely even remember the last lockout because my focus shifted to the Pistons, who ended up winning the NBA championship that previous season. I hardly even missed hockey because following a championship team was a nice distraction. The Pistons this season? They’re unfortunately not an option to follow closely again. So without the Wings, without the Pistons and without enough MSU basketball games to watch, I had more time in general. No planning my nights around a three-hour hockey game, getting overly emotional and having my mood depend on the success (or lack thereof) of the Wings or the other teams I like to follow. I fully prepared myself to spend the rest of what would’ve been a hockey season without it. And honestly? I was looking forward to it. Who knows if I even would’ve followed the NHL once it came back. Therein lied the danger not just with me but other fans. Even though I “swore off” the NHL, I still had one foot in. Had the lockout canceled another season, my other foot would’ve stepped out and I can’t really imagine following the league again. 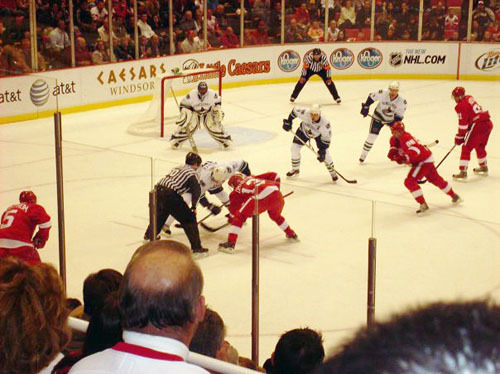 That one time … at the Wings game … where I chatted up a random guy during pregame skate who ended up giving me his two extra tickets to the game — in the 10th row. And I really, really, really missed it. Since its return, as the hockey world has been gearing up for the start of the shortened season, As I listen to commentary and read tweets, I’ve found it fascinating to learn of people who feel … this sense of entitlement now that the league is back. These people demand and feel it’s some sort of their right to be compensated in some sort of way for the inconvenience the lockout has caused. Discounted tickets. Free concessions. Free Center Ice and/or GameCenter. Huh? While those things are awesome and certainly great PR for the teams that are doing those promotions, I don’t think I’m owed anything, even if I had been a season-ticket holder for the past 10 years. It’s frustrating that some people say it is strictly because of the lack of some of these promotions that will keep them away from the game — for good. What a pathetic state of affairs for our society. I mean, it’s one thing to stay away because the lockout made you angry and you no longer wish to follow the product. It’s another to think had you been given a few goodies here and there, that would’ve kept your loyalty. It’s entertainment, and at the end of the day, it’s a game. You put in your time/money/whatever, you get entertainment in return. No one owes anyone anything, even if the season had been canceled for one or 10 years. On the other hand, have I become so emotionally unattached to the sport in such a way for things like that not to bother me anymore? Or maybe I’ve just grown up, or maybe hockey hasn’t continued to be my life, or maybe it’s all of the above. Maybe that’s why I don’t understand this outrage over the lack of deep promotions to win fans back.